Some say that the old USSR is a great place to look for advice on all matters American because Congress and the great, great, greatest President ever are quickly making US a Communist Nation? Maybe it will bring reat jobs. Somebody will have to guard the gulags to keep the US plebians from escaping to freedom? But, will anybody be free? It is a fact that the US is hiring more and more bureaucrats in Washington to administer the Obamacare system since it has become the law of the land. Many of them are IRS agents. Perhaps IRS agents will be armed and perhaps they will all be issued shiny black cars so whan they sneak you off in the black of night tothe gulags, they will not be seen. Many doubt that the government is up to the task of making enything work successfully. When was the last thing that government did anything right when it interfered with the natural economy. Why do UPS and Fed Ex outclass the Post Office and still make a profit.? Why is Norfolk Southern highly profitable while Conrail needs government funding? Why was Union Pacific hugely profitable while government controlled Amtrak to date has never been profitable -- and it looks like it will never be profitcable in the future. When was the last Amtrak ad that you saw. That should give you an idea why trains like The City of New Orleans have been minimalized by Amtrak over the years. Why is Medicare and Social Security Bankrupt? Why was Cash for Clunkers a debacle? Have no fear... government run healthcare, with your friends from City Halls, the Counties, the State Bureaucracies and worst of all the Feds running the system, is in the process of happening, despite the long history of government failings in private enterprise. And, yes, it too will fail and yes, this time it will be too late to fix. 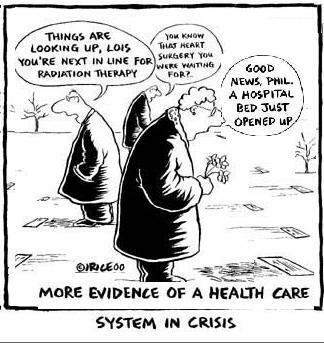 If government run healthcare fails you once, it may be the last time it matters. Perhaps to make the system work better, patients, such as you and I will be able to go to City Hall and stand in line in the City Inspector's Office so the Inspector can determine whether you can see your doctor or not. Perhaps in PA you will be able to go to the Department of Transportation (PENNDOT) since they have a lot of people working there. iOr, perhaps you can go to the PennDot building itself, like if you would if you were going for your driver's license, but with bigger crowds. You could take a number, get an online health test, wait like you would for a photo id, maybe even get your picture taken for your new health card, wait again, and then be interviewed by a hard working government worker to see if you really have to spend taxpayer dollars on your silly illness? . They fund these new folks' introduction to healthcare by reductions in Medicare ($600 Billion) and huge taxes on those "rich" people like you and I who already have insurance policies -- folks like you and me perhaps. No kidding! Members of large unions who typically support the Democratic party will be excluded with a special HHS exemption. But, what does all this really mean? When pressed, the government, the greatest creator of waste in existence, suggests the new system will get rid of all the waste in Medicare. Why not just get rid of the waste right now, without Obamacare if it exists and has been identified? They don’t want you to ask that? That's because it is not about waste. It is about stealing money from Medicare because there is nothing in Social Security to steal. Yet, seniors are not outraged because AARP sold them down the tubes. AARP lied to seniors so the AARP executives can pocket an additional $billion in insurance revenues when Medicare Advantage is outlawed by Obamacare. Funny how AARP, a non-profit entity will have a billion more dollars to spread around its corporate staff. Can the waste the government will eliminate be a code word for prescription drugs, doctor visits and special treatments such as dialysis and diagnostic toools such as MRIs. That's good, right, unless your use or your parents' or your relatives' use of the Medicare system is the waste of which they speak. Maybe keeping you or I alive is the waste of which they speak. If aIl of this "waste" were not funded, that surely would reduce the cost of healthcare, and with Obamacare, because there would be more people dying from government denials of service, the costs would be further reduced. With minimal care, people would die more rapidly. Does that sound like a plan? If Obama and his hard left czars were not running the country now, I would say, don't worry, this is America. Unfortunately, it appears that this President and at least half of this Congress would like to "change" our country so that America is not quite so American. So, let me suggest strongly that we do have to worry! To be on the safe side, I would recommend a lot of worry, and if you are looking for some follow-up action items, write your legislators and make sure you vote out the ones who do not think like US. Obama is a straight faced liar. He is no dummy. He knows and you know and I know that reductions in Medicare to pay for the healthcare of illegal aliens and others who never contributed to Medicare does not sound like a good idea to those who contribute every pay to Medicare. This is especially true if you are already on Medicare. What happens when there is no money in Medicare to pay for anything? Can you rely on Obama and Biden: two of the lowest donors to charitable causes in modern times? Ask yourself now while you are thinking about it if reductions in Medicare sound like something you should be concerned about? Obama said by taking money from Medicare it would strengthen it. Do you buy that? Besides being a Community organizer, did the PREZ sell Brooklyn bridges prior to his career in politics? Besides Medicare cuts, which mean that half of what is collected in paychecks that formerly went to the Medicare fund, will not go to the Obamacare fund for those who did not pay into Medicare . Yes, Obama is moving Medicare dollars to the general fund. People who never paid into Medicare will benefit from your Medicare contributions while your care gets less and less. That's the plan. Congress and the President are feeding the seniors a pack of lies. There are lots more to not like in Obamacare even if you are not on Medicare. We might call this plan the healthcare re-distribution plan. Just as income redistribution asks you to turn in your wallet so the government can determine what is fair for you to keep, healthcare redistribution asks you to turn in your Medicare plan or your insurance policy today so the government can determine what is fair for you to keep and which part of your healthcare plan should be redistributed to those who are "underserved" today. That's fair, isn't it. Maybe the government will be giving the homeless your home next. Why should they not live the same as you? Oh, maybe they never worked! But, then again having ever worked is not one Of Obama's criteria. . There are Bureaucrats that would like to shape Obamacare so the end result is that the fifty million new people merely get added to the Medicare rolls? That's the notion many see coming eventually from all of this work in Washington. With the final health bill taking about 2700 sheets of paper, there is more than ample opportunity for government control, government rules, and of course downright government lying. With the government in charge, will you feel better? Can government do anything better than anybody or anything? Do you trust that the Congress and the President will do what is needed so that you can have real healthcare? Consider this. If they did nothing, you would still have your healthcare. But, on the way to giving Joe down the street healthcare, they are taking yours. You may not beleive that because the President lies well, but please don;t get sick. There are simply not enough doctors to treat all Americans in Doctors' offices. The Obamacare plan is all about you giving up your right to a seat in your doctors office which you gained long ago because either you or your employer pay for your an insurance policy or you paid into Medicare. Why should you lose your seat? So that a group of others will no longer have to get their care in charitable clinics or in the Emergency Room and the ER-like adjunct clinics that are set up today for people with no health insurance. The Emergency Medical treatment Active Labor Act, known as EMTALA, from 1986 says all people, including illegal aliens are entitled to healthcare in any hospital ER if the hospital takes any Medicare patients. That means just about all hospitals offer medical care to all citizens regardless of whether you have a dime in your pocket. Then why was Obamacare needed? Obamacare never was about getting care; it is about giving up your seat in the doctor's office so somebody who has not worked like you all your life can take your seat. Like it or not, the new government has you pegged as a dirty capitalist pig, and the one who sat on their duff all their life receiving payments from your taxes, they are now known as those deserving of government care. The anti-capitalists in the Obama regime want you, instead of those who choose not to work, to go to the ER for primary service while the "neo-helpless" occupy your seat in your doctor's office. Maybe the ER will be the best place to go. Maybe you will have to go to the ER as those seats may be the only ones empty. A simple way to save money on Medicare / Obamacare if it survives, and I hope to God it dies a quick death for all our sakes, w cwould be to simply ration Medicare so that those who had been deprived of healthcare for so long can catch up. The Inspectors at City Hall or the clerks at the DMV can handle the rationing, for sure. Perhaps if there are post office cutbacks, there would be another source of people to help ration your care so they did not have to leave their lucrative government positions. Consider that those who have never had real healthcare-- like you are now selfishly enjoying-- are perhaps 100 doctor visits behind you. Maybe the number is even higher but 100 is big enough. Just like affirmative action seeks redress for the egregious sins of the past, so also can the new healthcare plan gain such redress by prioritizing the newly covered over those who have been gaining the benefits merely because they contribute. Once the formerly underserved get their 100 back-visits, then maybe you will be able to make an appointment with a doctor someplace. Then, the plan can begin to function normally but, statistically, there will be twice as many patients and 1/2 as many doctors and your insurance plan will not be what it once was, despite all the promises. That will certainly save costs and that is the primary government goal of Obamacare; is it not? The irony is that access to healthcare for those that once had access (you and I), will be thought of as the good old days. Healthcare redistribution is designed to make those who have benefited from having Medicare or another healthcare plan reconsider the needy. Having had our plans for so long, you and I may actually believe that just because we paid for it, we are entitled to it. The Obamaplan helps everybody who has enjoyed healthcare in the past to see what it feels like to be part of the under-served. Some Obama people suggest that the idea of healthcare rationing is long overdue because of the many abusers, especially the elderly. I have heard some Obama followers say that just because the elderly want a few more years of life, it should not cost the rest of us big-time. So, I can see why Obama redirected $600 billion from Medicare to those who have a lot more years left. Rather than have an expensive doctor decide which treatments or which medications patients need to eliminate to control costs, would it not be better to have a caring government representative handle that burden for the medical community. Again, it may be a City Inspector or a DMV clerk, or a Postal clerk, so these folks would continue getting their salary and benefits and they can help make up for the Doctor shortage. Even if prescribing medicine requires more skill than dispensing stamps, nobody can deny that the Postal Workers can get the job done with less expense. Perhaps the right number of doctor visits is really one visit every three years and say, five pills a week, or maybe a month. Since doctors only care about health and keeping people alive and wise government employees in the Obama regime are the only ones qualified to see the whole picture, they know that costs will not go down if it is left up to the doctors. Doctors want to make you people better. The problem with that accoring to Obamanalysts is that if you get better, you will only be a burden on the state later on. Oh, we don’t call it the state yet, but when Obama finishes his four year plan, the country will be known as the STATE. Working our way back to 2009, we see that the stimulus bill of February 2009 already included funding for the wise government regulators who would be trained in the proper healthcare rationing tools to reduce costs to a manageable level. This was long before the healthcare bill passed and became law. The PREZ was already staffing the czardom to handle what was necessary when the bill passed. By the way, if you read the Obamaliterature, it suggests that is a few patients die, but the government saves money, and the cost to society is less, it is most probably worth the change? It really is the only way to make this wonderful plan to help the under-served work properly. Think about it. Would it not be better to have a wise government employee determining your needs in relation to the needs of others rather than to continue to permit the outright hogging of medical resources for the few while the many go underserved? Are we not interested in being a nation of fairness? After 65 years of good medical care, should not the seniors let somebody else, who has not had care all their lives, gain entitlement to what would have been their care in their senior years? With simple rules like that, fewer doctors would be needed as ordinary government workers would be able to use the regulations to help the process and more importantly to save costs. Regarding health care, all the government needs to do is "just say no,' and the costs will go down as patients die sooner. Then, we will all be better. If people begin to die say five to twenty years sooner, can't we say that would be the necessary breakage so that all Americans, not just a select few can enjoy the benefits of government assured Obamacare. The beauty of such a package is that after the City Hall Inspector teams, the DMV teams, and the furloughed Postal teams are depleted, the additional people for the government health rationing team can be selected from the population at large. Thus, in these tough economic times, those who have yet to be gainfully employed can get positions in the Government Rationing Department, thereby solving another issue for the country. Putting people to work for the first time is a noble notion indeed. Isn't having yourself or some loved ones not getting say those last ten years of life worth the benefits? Don’t run to Canada yet! They are worse than us at least now! I am just kidding about all of the above except what may happen. I know, everything I just said is silly. Nothing like that can or will ever happen because this is America. The only way something like that would ever happen, would be if our busy lawmakers in Congress did not read the parts of the Obamacare bill that more or less prescribe an America Health System in those "silly" terms applied. Whoops! They didn’t get a chance to read the bill, so don’t blame them. They’ll be running again soon! Yes, there are major planned reductions in Medicare to feed Obamacare!. The government which is a fairly agnostic entity suggests that if you are concerned about the problem with big reductions in Medicare even if somebody else benefits, think about what you would say to your maker for putting your life above that if somebody who never worked a day in their life. ? 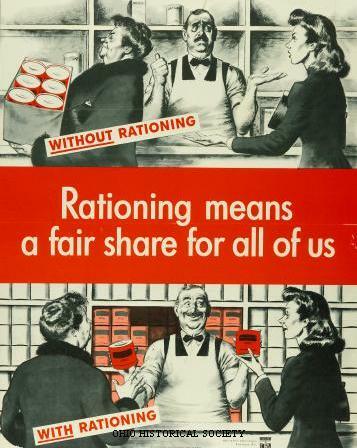 Why do they call it Healthcare Rationing?